We are pleased to invite participation in KES2012 organised by the University of the Basque Country (UPV/EHU) and Vicomtech - IK4 in conjunction with KES International. Papers are invited from a wide range of intelligent systems research topics. The conference proceedings will be published by a major publisher with wide visibility and indexed in a number of places. The conference will take place in the city of San Sebastián or Donostia, a vibrant city presiding over the beautiful Bay of Biscay in the North of Spain, near the border with France. Donostia is an important city of commerce and tourism in the heartlands of the Basques and is proud of its Basque traditions and language. 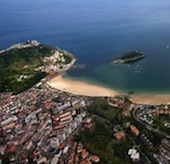 The city may be more familiar to the outside world through its Spanish name, San Sebastián, site of the famous annual San Sebastián International Film Festival. The agreeable climate and the scenic views have long proved a draw for many visitors, from ordinary families to international film stars. In recognition of this, the city has been selected as European Capital of Culture for 2016 (jointly with Wroclaw, Poland). The conference will consist of keynote talks, oral and poster presentations, invited sessions and workshops, on the applications and theory of intelligent systems and related areas. It will provide excellent opportunities for the presentation of interesting new research results and discussion about them, leading to knowledge transfer and the generation of new ideas. The Full Conference Programme is available as a PDF document ..here.. The KES2012 proceedings will be published by IOS Press. See .. here .. for more details.